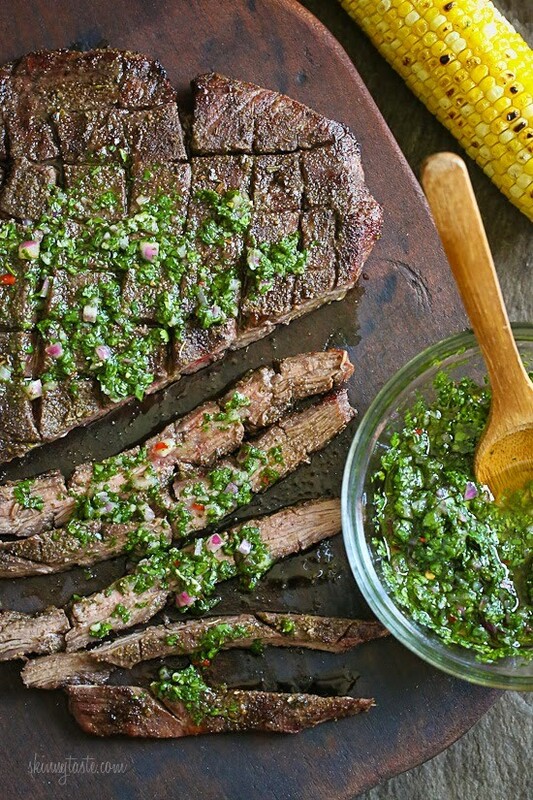 Delicious flank steak topped with homemade chimichurri makes the steak pop with freshness and zing. It is also great on chicken or fish. The chimichurri sauce can be made a day ahead. Using sharp knife, lightly score the steak about 1/8 inch deep on both sides in a crisscross pattern at 1/2-inch intervals. In a small bowl combine the cumin, garlic powder, oregano, freshly ground pepper and kosher salt. Season both sides of the steak with season spices. Prepare the grill on high heat. Grill the steaks to desired doneness, about 3 to 4 minutes per side for medium-rare, turning steaks 1/4 turn after 1 1/2 minutes to form crisscross grill marks, if desired. Transfer steaks to cutting board; let rest 5 minutes. Thinly slice steaks across grain. Transfer to platter and top with chimichurri sauce.